Note: As of early 2015, large new swaths of land here have been restored to wetlands (formerly drained and farmed). The opportunities should multiply as birds move back into newly flooded areas. 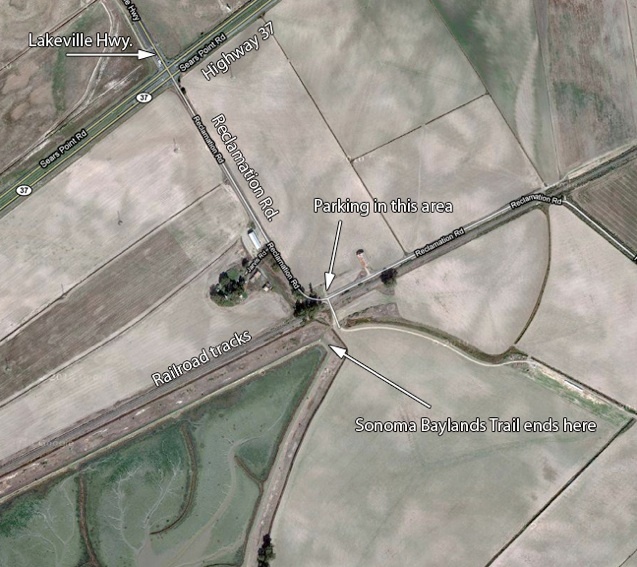 Location: This is the southern extension of Lakeville Hwy., which connects Petaluma (to the north) and the north end of San Pablo Bay (Lakeville Hwy. proper ends at a T-junction with Hwy. 37). Reclamation Rd. is thus the road on the other side (the south side) of Hwy. 37. Reclamation Rd. gives access to the end of the Sonoma Baylands Trail. GPS address: 7699 Reclamation Rd., Petaluma, CA will take you to the first buildings on the road, south of Highway 37. GPS Coordinates: Coordinates of 38.1282N, 122.4713W (or 338 07 42N, 122 28 17W) will take you to the area near reclamation road and the railroad tracks shown on the map. Access: There are no parking areas, but the road is lightly traveled. Park as convenient on the side of the road. Reclamation Rd. gives access to the end (or start, depending on your perspective) of the Sonoma Baylands Trail (about which I will add more information soon). Restroom facilities: None. Closest restrooms are at Port Sonoma Marina. Restaurants nearby: Nothing in the immediate vicinity. There is a Starbucks at 3100 Lakeville Hwy. (775-3708) for the basics. Otherwise, Petaluma (further to the north) is probably the best bet for lunch in the area. My favorite in Petaluma has long been the Water Street Bistro at 100 Petaluma Blvd. North, Petaluma, CA 94952 (763-9563). Small, but delicious. Lombardi’s Barbecue (3413 Petaluma blvd. North, Petaluma, CA 94952; 773-1271) has excellent sandwiches. Try the pulled pork sandwich. Ask for your cole slaw IN the sandwich. Yum. Related bird watching spots: The closest birding spots are at Port Sonoma and Skaggs Island Rd. (south end). See relevant pages for details. Shollenberger Park is about 20 minutes north of Port Sonoma, in Petaluma. Adjacent to Shollenberger Park is Ellis Creek Water Recycling Facility. On the opposite side of Shollenberger Park from Ellis Creek Water Recycling Facility is Alman Marsh. See the pages for Shollenberger Park and Ellis Creek Water Recycling Facility for details.